Luraney Houghton was born on March 22, 1813 in Waterford, Oxford County, Maine. He was the son of Deacon Jonathan Houghton and Tirzah Flint. Luraney died on September 10, 1814 in Waterford, Oxford County, Maine, at age 1. 1825 a second company of cavalry was formed in Waterford, and Luther Houghton, who shared the military spirit with his ancestors, was the last captain of the organization. Luther Houghton was a member of the Congregational church at Waterford Flat, and for forty years led its choir. Capt. Luther Houghton was a tavern-keeper and farmer. Luther married Mary Hale, daughter of Oliver Hale and Eunice Fletcher, on September 29, 1846. They were first cousins once removed. Luther died on May 15, 1880 at age 71. Marcellus Houghton was born on September 21, 1819 in Hallowell, Kennebec County, Maine. Marcellus died on December 17, 1895 in Medford, Massachusetts, at age 76. Mary Houghton was born on June 1, 1797 in Waterford, Oxford County, Maine. Mary A. Houghton was born in 1841 in Maine. She was the daughter of Lewis Willard Houghton and Mary Ann Nourse. Maine Genealogical and Historical Register, , IX , 4: 108. Lineage book of the charter members of the Daughters of the American Revolution, Washington, District of Columbia: Daughters of the American Revolution, (1891-1939) , V. 16. Nancy Reed Houghton was born on August 15, 1836 in Waterford, Oxford County, Maine. Nancy died on March 26, 1838 in Waterford, Oxford County, Maine, at age 1. Thomas W. Baldwin, Vital records of Harvard, Massachusetts to the year 1850, Boston: Wright & Potter, (1917) , p. 64. Lorenzo Sayles Fairbanks A.M., Genealogy of the Fairbanks Family in America, 1633-1897, , at https://books.google.com/books?id=rbJ3WLoOEo0C . Boston, MA: American Printing and Engraving Co., (1897) , p. 401. "Massachusetts State Census, 1855," database with images, FamilySearch (https://familysearch.org/ark:/61903/1:1:MQ4D-2QS : 15 November 2014), Rachel Fairbank in household of Artemus Fairbank, Harvard, Worcester, Massachusetts, United States; State Archives, Boston; FHL microfilm 953,963. 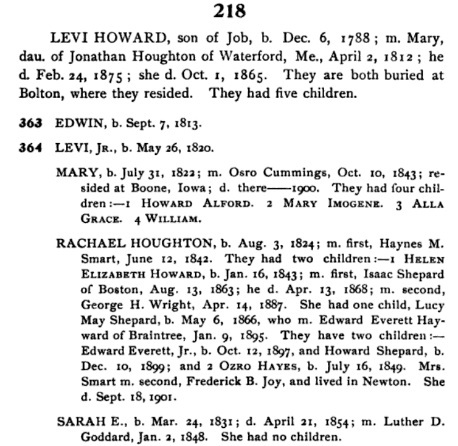 "Maine Births and Christenings, 1739-1900," database, FamilySearch (https://familysearch.org/ark:/61903/1:1:F4SC-RZX : 4 December 2014), Sally Houghton, 20 Aug 1795; citing Waterford, Oxford, Maine; FHL microfilm 12,625. Avis Stearns Van Wagenen, Genealogy and memoirs of Isaac Stearns and his descendants, Vol. 1, , at http://books.google.com/books?id=SvAUAAAAYAAJ . Syracuse, N. Y.: Courier Press Company, (1901) , p. 58. 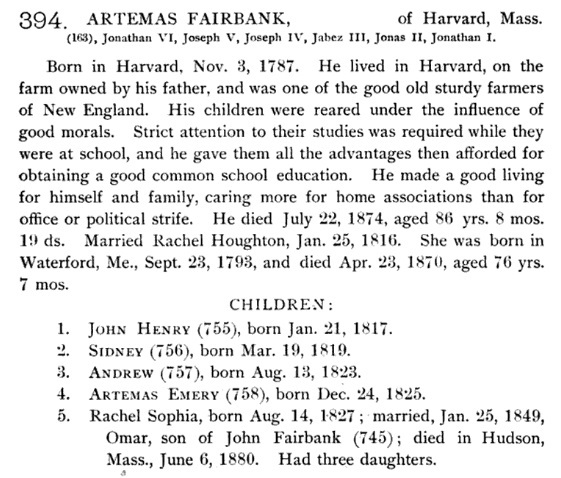 "Massachusetts Births and Christenings, 1639-1915," database, FamilySearch (https://familysearch.org/ark:/61903/1:1:FCGQ-K91 : 4 December 2014), Simeon Houghton, 23 Jun 1747; citing HARVARD,WORCESTER,MASSACHUSETTS, ; FHL microfilm 0874025 IT 2.